HELP JASNA-VERMONT: All profits from merchandise we have for sale benefit our Vermont REGION. Wilson, Kim. Tea with Jane Austen. Jones Books, 2004. $18. There’s even a JANE AUSTEN doll! JASNA-VT member Carol Madden sent a beautiful JANE AUSTEN Card, and we just had to track down where the rest of us might get a box. 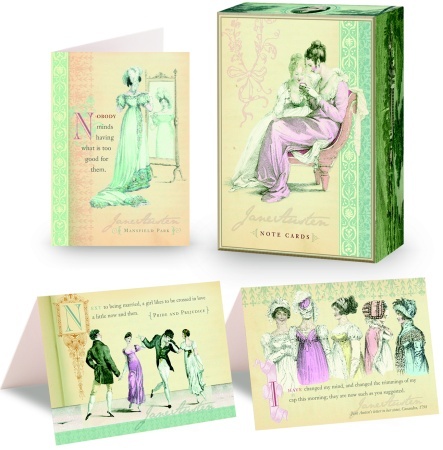 These note cards are $12 for a box of 16 (with 17 envelopes), and feature four different designs. We’ve seen the one featured on the box (“Friendship is certainly the finest balm for the pangs of disappointed love.” is the featured quote; the illustration is ‘Evening or Full Dress,’ Ackermann’s Repository of Arts, 1810), and the drawing is truly enchanting! Potter Style also features a Jane Austen journal ($10.95), for those who like to write more than a little note, and an address book ($8.00). Jane Odiwe also produces Austen greeting cards – from her own drawings! These depict Jane and her family, as well as scenes from her novels. Cards are $2.50 each / or 5 for $10. JASNA-VT has many of these available for purchase at our meetings. TEA? Earl Grey, Lapsong Souchong? One company that Kelly has ordered from and highly recommends is Upton Tea Imports in Hopkinton, MA. Dealing predominantly in loose teas, Upton offers low-priced samples, tea in bags or tins, and a selection of cups, pots and other items tea-drinkers would just love to have. Can shop online or via their quarterly catalogue. Standard domestic shipping is just $4 per order – not based on weight or cost. Fast service. The following JASNA regional groups offer unique Jane Austen-related merchandise: note cards, t-shirts, books, music, prints, linens, cookbooks, and more. Shop these pages for the perfect gift for yourself, a friend, or another literature lover! All proceeds benefit JASNA Regions.